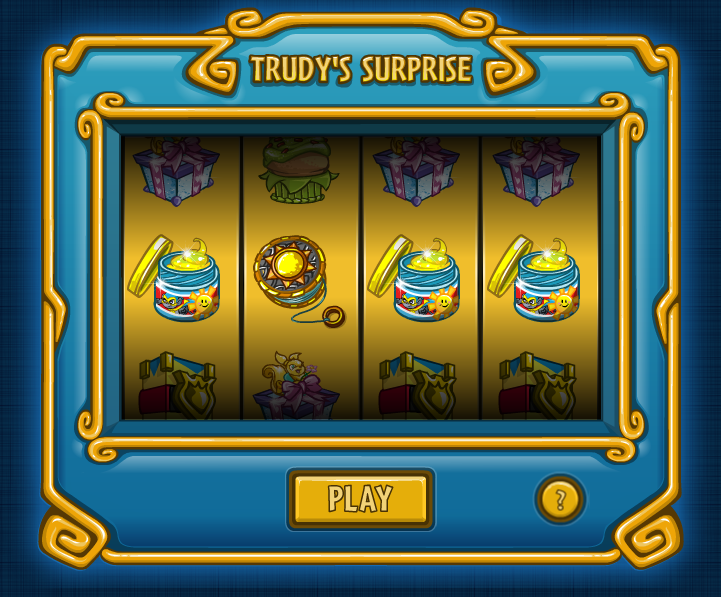 Trudy's Surprise Slot Machine is a daily that features prizes of increasing potential worth for each consecutive day that it's played, up to 25 days. At that point, prizes reset and the process begins again. There is an FAQ on Neopets for more details. It should be noted, that only accounts owned by players over the age of 13 are able to use Trudy's Surprise. The machine first appeared on July 17, 2015 with glitches that prevented prizes from being awarded. It was fixed by the 18th, and properly announced in New Features on July 24th. Trudy's Surprise is available to spin once per day, starting at midnight NST each day. A notification is sent to you during the day (not necessarily right at midnight) reminding you of your daily spin. If you do not wish to receive the notification (on side accounts, for example) you can disable it in your preferences. You will not be able to spin the wheel if it is disabled in preferences. When Daylight Savings Times begins for the United States (typically in early March), the day following the clock change, Trudy does a hard reset for all Neopians and prevents you from spinning for that day. When it was first released, Trudy's Surprise was available to spin every 24 hours rather than once a day, regardless of what time you spun. For example, if you spun it at 5:12 PM NST, you would not be able to spin it again until 5:13 PM NST the following day. This setup was changed in the month of Relaxing, Y18. Your prize is awarded based on matching icons in your daily spin. Matching absolutely no symbols activates a Bad Luck Bonus - where more Neopoints than the jackpot are awarded. This bonus is only available once per 7 days per user. If you fail to match any icons within that week a 2nd time, you will instead receive the normal no matches prize. Should you get 2 unique pairs of matching symbols (say two creams and two yoyos), they will count as if you had 4 matching symbols. Should you miss a day at any point, the prizes will reset to Day 1 levels and you must begin again. The same will happen once you claim your 25th spin in a row. This avatar is awarded on your 25th consecutive spin at Trudy's Surprise. (Or in other words, when you win 100,000 NP!) You will receive a neomail notifying you of obtaining the avatar or see a "Something Has Happened" event on the page itself. Due to the fact that Trudy's Surprise awards Neopoints, users cannot take part in it as a daily activity on side accounts. To avoid seeing the pop-up when visiting a side account, select the Block Trudy's Surprise option in the Site Preferences of any account you would like to disable it on.